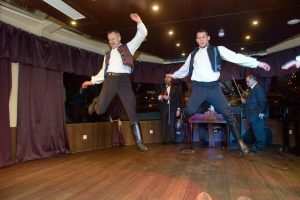 How to pick the Danube river cruise? When a city is fortunate enough to be graced with such beautiful riverside as Budapest, it is inevitable to try a budapest river cruise while visiting. 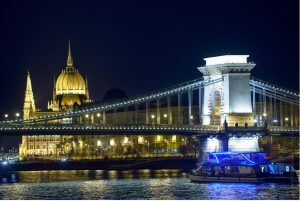 Europe’s second largest river is one of the most buzzing spots of the city and due to the great number of landmarks and sights that surround it, it is also one of the most sought after destinations of the Hungarian capital. But amongst all the options which danube river cruise is the best to opt for? During this 90-minutedanube boat trip, visitors get to familiarise themselves with the historical and cultural background of Budapest. The boat sails past monuments like the House of Parliament, the Castle District and the Citadella. Audio guide is available in 11 languages and those who cannot do sightseeing without a little snack are awaited with a large selection of munchies and drinks in the buffet. This premium boat trip is ideal for anyone wanting to get to know Budapest in detail, and for those who want to mix up their regular sightseeing game. Join us for a boat trip that is one of a kind in Hungary. The upgraded version of our sightseeing cruise comes with a wide range of optional, high quality street food and unlimited beer and soft drinks. We recommend this boat trip for couples and groups alike. Whether it is fun sightseeing or a warm up session before a night out is what you are looking for, our Pizza and Beer cruise has got it covered. Premium boat trip with wonderful bonuses and guaranteed entertainment. Indulge in an exquisite fine dining experience on river Danube. During this 3-hour boat trip along River Danube, guests are served 4 courses that alone are wonderful treats to ones’ taste buds. Once dinner is over, two pianists take the stage in an attempt to win the singing lady over. The musical battle takes guest on an exciting journey as a vast variety of songs are performed, ranging from sad to upbeat tunes. Candle lit dinner and boat trip in the majestic Hungarian capital. Recommended for all. This boat trip is ideal for those wanting to discover the Budapest’s significant cultural and historical landmarks with ease and class. 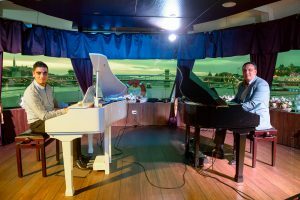 Real, hand-selected musicians provide grand entertainment throughout the cruise. 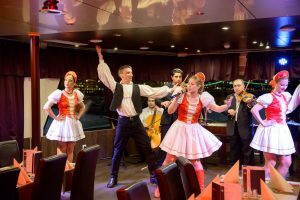 In addition to our enthusiastic band of folk musicians, dancers dressed in traditional Hungarian costumes warrant your absolute comfort and diversion. Wine and dine with utmost elegance and do not be surprised that as our boat trip is coming to its end, you will start to feel like an actual Hungarian.